Chicago Alderman Willie Cochran pleaded guilty Thursday to a federal fraud charge for pocketing money from a charitable fund intended to help families and children in his South Side ward. Cochran, 66, pleaded guilty to one count of wire fraud. The conviction is punishable by up to 20 years in prison. U.S. District Judge Jorge Alonso set sentencing for 2 p.m. June 20. The FBI initiated an investigation after receiving information from the former Chicago Legislative Inspector’s General Office. 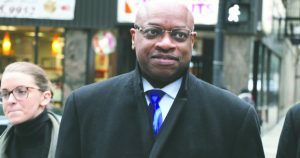 While representing the 20th Ward, Cochran operated the 20th Ward Activities Fund, which he purported to use for charitable endeavors to help families and children living in the ward. Cochran controlled a bank account connected to the fund. When soliciting donations to the fund, Cochran falsely represented that all contributions would be used for charitable events, including a back-to-school picnic, a Valentine’s Day party for senior citizens and holiday events in November and December. Cochran admitted in a plea agreement that he used some contributors’ money for his own personal use, including paying his daughter’s college tuition, withdrawing cash at casino ATMs and purchasing items for his home. From 2010-14, Cochran pocketed $14,285 from the fund and converted the money to his own personal use, according to the plea agreement.